RAV4 outsold Camry, Corolla, and all else not a pickup in 2018, and the 2019 should reinforce that. Through the years, the competition between Toyota and Honda has been played out in every size and segment. The Camry and Accord have dueled for decades among midsize sedans, the Corolla and Civic have had a similar duel among compacts, and when the surge to SUVs was popularized, Toyota’s RAV4 and Honda’s CR-V have been at the top of the compact crossovers. It’s just that nobody could have projected exactly how popular those compact SUVs would become. A few years ago, after the Accord became the top-selling sedan chosen without the boost of fleet sales, Toyota chose to start selling Camrys to rental-car and other fleets and wrested the top spot away from the Accord. As of the end of the 2018 model run, though, the CR-V rose above the Civic and the Accord to become Honda’s top-selling vehicle. At the same time, the RAV4 passed up the Camry to become not only Toyota’s largest seller, but also the largest-selling car or SUV in the U.S. The RAV4 did it with the same formula it used with the Camry — cautious styling and conservative engineering, designed for the long haul, to provide trouble-free driving for years, with engines that might be unexciting in performance but would cruise for well beyond 100,000 miles. It’s a winning formula, but almost ironically the RAV4 took over the top spot even while growing admittedly long in the grille. Ever since Akio Toyota took over the corporation, enthusiasts have waited for his performance-preference to create more exciting things for the Toyota and Lexus lines, and in some ways those dividends are showing up. New Tacoma-like grille sets off new platform under all-new 2019 RAV4. 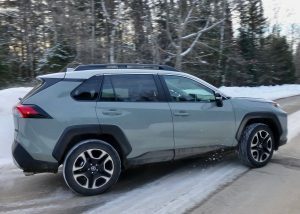 For the 2019 model year, the RAV4 is all new, getting a new shape, a new platform underneath, a new grille, and new powertrains. 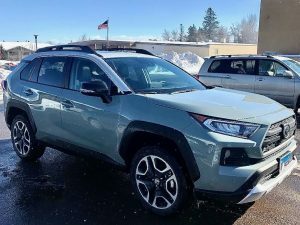 The 2018 RAV4 got a new model, called the Adventure, which improved much of its characteristics, and that model returns on the new 2019 model, which starts with a large, open grille that almost seems destined to gulp down the competition and retain its place as sales leader. 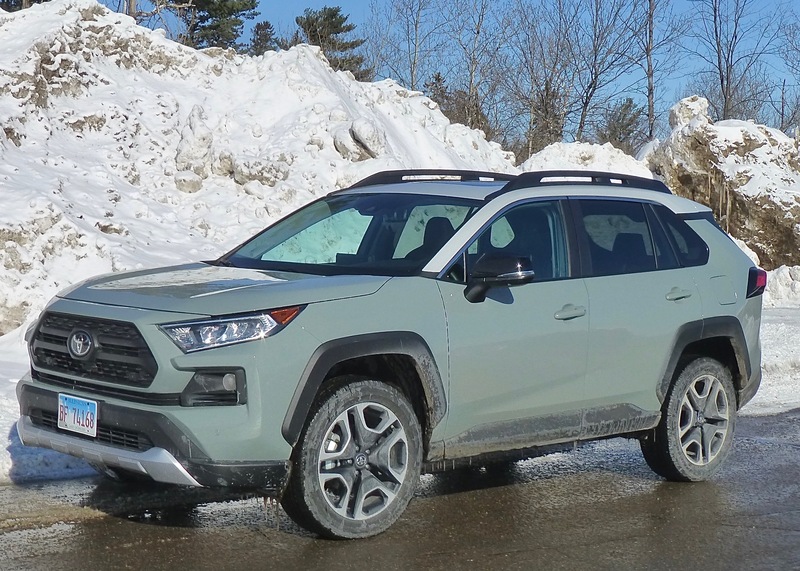 The RAV4 arrived late on the market, and while I didn’t get invited to the press introduction, I was able to get an early 2019 RAV4 Adventure as soon as they hit the press fleets across the country. Timing was perfect, because up here in the Great White North, Duluth, Minnesota is shoveling its way into March, past a February that set records for the most snow and, it seems, the coldest temperatures, simultaneously. Every feature of the new RAV4 is improved over the outgoing generation. The exterior look is striking, although the Adventure test vehicle has a white top on the “Lunar Rock” paint color, remindful of the FJ utility vehicle’s contrasting color scheme, so maybe that’s standard. 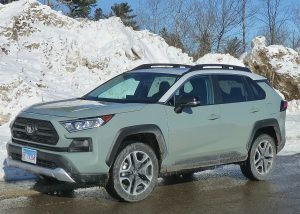 The big grille looks a lot more menacing, and from the front, the RAV4 greatly resembles the front end of the enormously popular Tacoma midsize pickup. The RAV4 shares the new 2.5-liter 4-cylinder that made its debut in the new Camry, and it is a significant upgrade in power. The new engine, with dual variable valve timing, has 203 horsepower at 6,600 RPMs, compared to 176 in the outgoing engine, and it has 184 foot-pounds of torque, peaking at 5,000 revs, compared to the 2018’s 172. 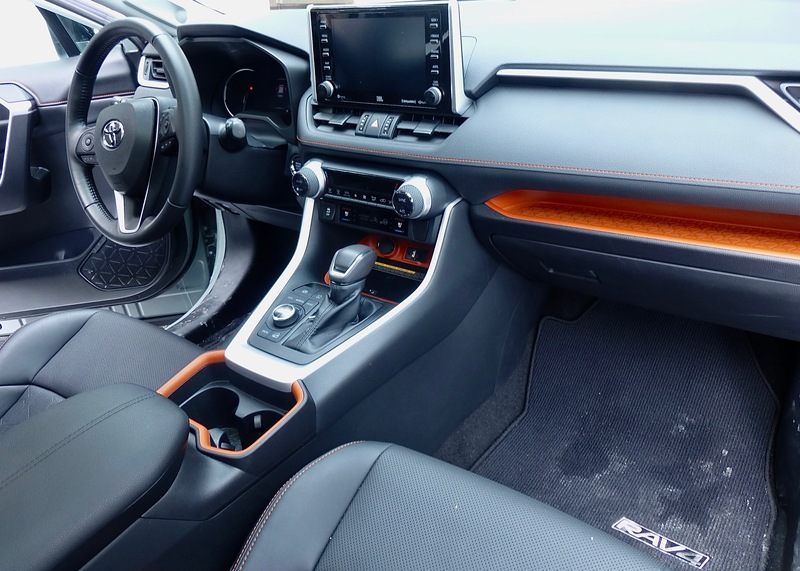 Flashy orange accent stripe sets off interior as RAV4 swaps dowdy for contemporary. It all runs through an 8-speed transmission with torque-vectoring all-wheel drive. Driven without considering competitors, the new RAV4 has plenty of power and will tow up to 3,500 pounds. In blizzard conditions, which we’ve grown used to, you could make use of the console switches to choose mud and sand, rock and dirt, or snow (there it is!). You also can dial it to Eco, Sport, or Normal. My guess is that most RAV4 buyers will leave it in Normal or Eco, for best mileage and adequate handling, although clearly the Sport setting stiffens the cornering and steering and hold shift points higher. There is a trend among modern auto writers to downplay, or even ignore, engine technology and capability and even the big-time magazines have lowered their standards in that regard. They have, however, run some early comparison tests, and Motor Trend ranked the RAV4 only fourth, behind the CR-V, Mazda CX-5 and Subaru Forester, but a tick ahead of the Hyundai Tucson, followed by the Nissan Rogue, Jeep Cherokee and Chevrolet Equinox. My guess is the new Ford Edge wasn’t available in time for the competition. 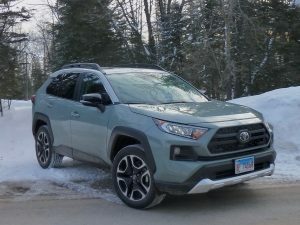 The most startling thing about the comparison was that the RAV4 Adventure was the most expensive of the batch by several thousand, approaching $40,000, it was far behind in 0-60 runs, trailing the CR-V and Jeep Cherokee, for example, which make more power from smaller engines by using turbochargers. The Cherokee, with the new Chrysler-designed 2.0-liter 4, makes 270 turbocharged horsepower and got 0-60 in 6.6 seconds in Motor Trend’s comparison, while the RAV4 needed 8.5 seconds — almost 2 seconds difference. The CR-V did it in 7.6 seconds, with a turbo 1.5-liter engine. Toyota buyers, or those looking for Toyota’s legendary dependability, won’t be drag-racing their neighbors in their RAV4s. and they will be quick to show off all of its other attributes, which are many. Refined proportions and smoother silhouette are all assets of the new RAV4. The interior, for example, goes from plain and maybe dowdy to very attractive and almost flashy. Well-bolstered SofTex bucket seats, heated and cooled, hold you in place, after you buckle yourself in. Look around and you’ll be impressed by the fit and finish of all the panels and materials, and the bright orange trim on the dashboard and in the various little bins, including one that will recharge your smartphone. Keyless entry is nice, although there was no auto-start on the test vehicle, and you will appreciate the rain-sensing wipers and the power sliding sunroof, which Toyota calls a Moonroof. To justify a price sticker that climbs from $32,900 for the base Adventure model to a lofty $39,634 as tested, the vehicle was loaded with options on top of an impressive standard array. Standard, for example, is a pre-collision warning with pedestrian detection, radar cruise control, lane departure alert and steering assist with lane-tracing assist, and a blind spot monitor with rear cross-traffic alert, and hill-descent control, which Toyota calls “Downhill Assist Control.” Standard also are 19-inch alloy wheels one the Adventure, with “Adventure grade” roof rails, and a power rear liftgate. and automatic high beams on the LED headlights. Also present are stability control and antilock brakes with electronic brake force distribution and Smart Stop Technology, which we think means it won’t hit those objects it detects up ahead. New array of colors, and quirkiy white-roof scheme set 2019 RAV4 apart. Integrated foglight and anti-theft alarm also are standard. The option package gives you an 8-inch touch-screen with hands-free Bluetooth phone and music connectivity, and what Toyota calls its Entune audio system which increases the system from 6 to 11 speakers. Toyota loyalists will be blown away by all the features and the sophisticated trim, as well by the more solid platform and improved power. They won’t care a bit that, in the time since Toyota last made a new and high-tech engine, Hyundai, Mazda, Honda, and Nissan have made extremely high-tech new engines, all of which leave Toyota’s new engine with no breakthrough assets in power or fuel economy. 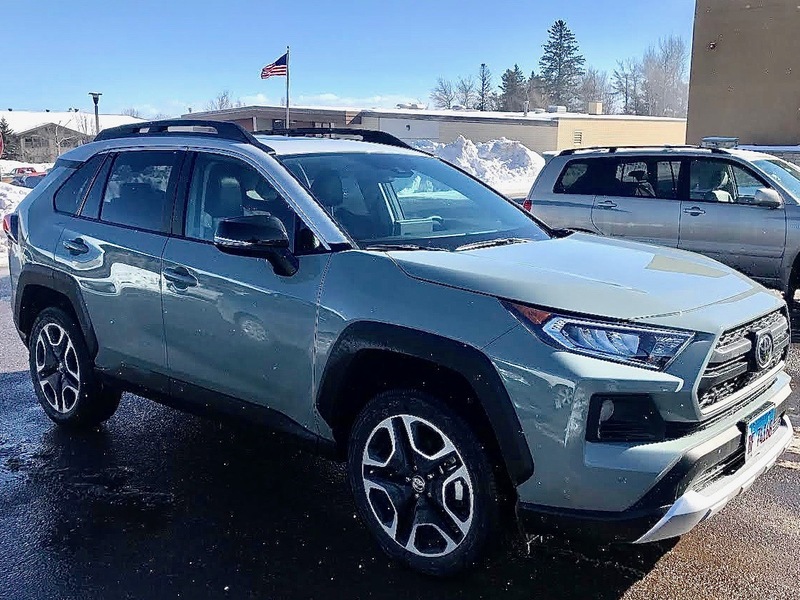 But if the RAV4 is trailing in power and excitement in driving, it is still a RAV4, and now it is packed full of all the latest creature features that are aimed at keeping it the largest-selling car or SUV in the country.